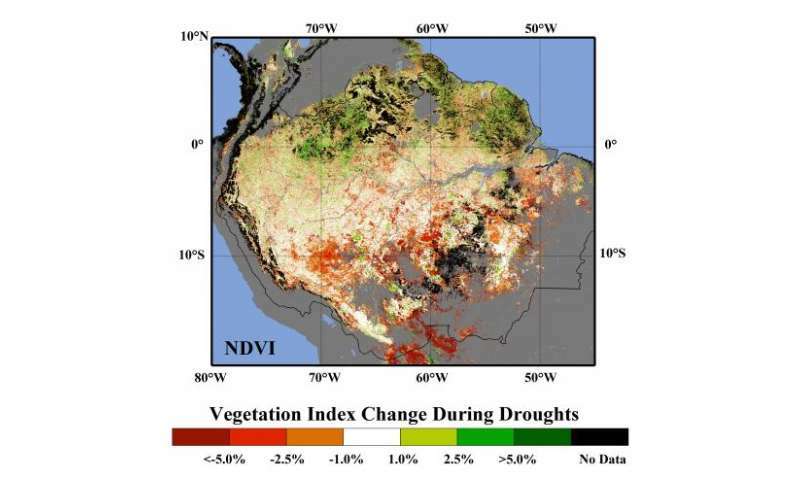 During the 2005 and 2010 droughts, satellites detected decreased vegetation greenness -- or a lower Normalized Vegetation Index (NDVI) -- over the southern Amazon rainforest (orange and red regions). NDVI is derived from MODIS instruments on NASA's Terra and Aqua satellites. Credit: Ranga Myneni, Jian Bi and NASA. A new study suggests the southern portion of the Amazon rainforest is at a much higher risk of dieback due to stronger seasonal drying than projections made by the climate models used in the latest report by the Intergovernmental Panel on Climate Change (IPCC). If severe enough, the loss of rainforest could cause the release of large volumes of the greenhouse gas carbon dioxide into the atmosphere. It could also disrupt plant and animal communities in one of the regions of highest biodiversity in the world. Using ground-based rainfall measurements from the past three decades, a research team led by Rong Fu, professor at The University of Texas at Austin's Jackson School of Geosciences, found that since 1979, the dry season in southern Amazonia has lasted about a week longer per decade. At the same time, the annual fire season has become longer. The researchers say the most likely explanation for the lengthening dry season is global warming. "The dry season over the southern Amazon is already marginal for maintaining rainforest," says Fu. "At some point, if it becomes too long, the rainforest will reach a tipping point." The new results are in stark contrast to forecasts made by climate models used by the IPCC. Even under future scenarios in which atmospheric greenhouse gases rise dramatically, the models project the dry season in the southern Amazon to be only a few to 10 days longer by the end of the century, and therefore the risk of climate change-induced rainforest dieback should be relatively low. The report appears this week in the journal Proceedings of the National Academy of Sciences. "The length of the dry season in the southern Amazon is the most important climate condition controlling the rainforest," says Fu. "If the dry season is too long, the rainforest will not survive." To see why the length of the dry season is such a limiting factor, imagine there is heavier than usual rainfall during the wet season. The soil can only hold so much water and the rest runs off. The water stored in the soil at the end of the wet season is all that the rainforest trees have to last them through the dry season. The longer the dry season lasts, regardless of how wet the wet season was, the more stressed the trees become and the more susceptible they are to fire. The researchers say the most likely explanation for the lengthening dry season in the southern Amazon in recent decades is human-caused greenhouse warming, which inhibits rainfall in two ways. First, it makes it harder for warm, dry air near the surface to rise and freely mix with cool, moist air above. And second, it blocks cold front incursions from outside the tropics that could trigger rainfall. The climate models used by the IPCC do a poor job representing these processes, which might explain why they project only a slightly longer Amazonian dry season, says Fu. The Amazon rainforest normally removes the greenhouse gas carbon dioxide from the atmosphere, but during a severe drought in 2005, it released 1 petagram of carbon (about one-tenth of annual human emissions) to the atmosphere. Fu and her colleagues estimate that if dry seasons continue to lengthen at just half the rate of recent decades, the Amazon drought of 2005 could become the norm rather than the exception by the end of this century. "Because of the potential impact on the global carbon cycle, we need to better understand the changes of the dry season over southern Amazonia," says Fu. Some scientists have speculated that the combination of longer dry seasons, higher surface temperatures and more fragmented forests resulting from ongoing human-caused deforestation could eventually convert much of southern Amazonia from rainforest to savanna. Earlier studies have shown that human-caused deforestation in the Amazon can alter rainfall patterns. But the researchers didn't see a strong signal of deforestation in the pattern of increasing dry season length. The dry season length increase was most pronounced in the southwestern Amazon while the most intense deforestation occurred in the southeastern Amazon. Because the northwestern Amazon has much higher rainfall and a shorter dry season than the southern Amazon, Fu and others think it is much less vulnerable to climate change. Look at the included graph of DSL and DSE carefully. The fitted linear trend lines are conveniently misleading. The values have varied quite a bit from '79 to the end of the study (2011?) with obviously stable, rising, and falling trends with the '79 values and 2011? values very similar. So, drawing ANY conclusion from this work is very hard to justify. No it's not - a line of best fit averages out the areas above and below the fitted line. It is what it is - a rising trend. You don't just draw a straight line across when the majority of points will be above that line, now do you? What you are describing is a short-term variation that overlies the general rising trend and is thinking that's behind claims that the current global (air) temp rising pause somehow negates all the increase that came before.